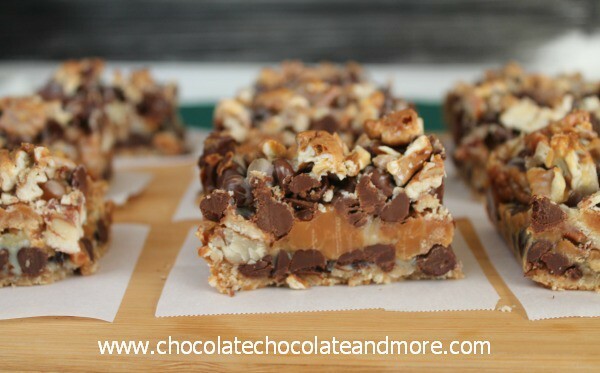 Magic Turtle Bars - Chocolate Chocolate and More! Wow, who knew taking a few days off for the holidays would put me so out of whack? The kids may be on vacation from school and the hubby did get a few extra days off, but as the mom, I didn’t get any time off. The laundry still needed to be done, the family still wants to eat and then there’s all the “extra” associated with the holidays. The decorating, the big meals, feeding 9 for 6 days, even if breakfast is cereal or bagels, still adds up when it comes time to do the dishes. I wouldn’t trade a moment of it. The house still needs to be put back in shape, the decorations now need to be taken down and stored. I am making everyone eat leftovers, so at least I’m getting out of preparing “new” meals. Besides, our turkey was to die for and we also had a ham so there’s plenty! I’d like to tell you we still have plenty of sweets around but, the supply is quickly dwindling. In addition to making my family eat leftovers the past 3 nights, I also hid these bars from them. Well, not exactly hid, but I did put them in a solid (not see through) container, in the back, behind all the other treats. Technically, I might have buried them, just so I could keep them for myself. You can’t blame me. 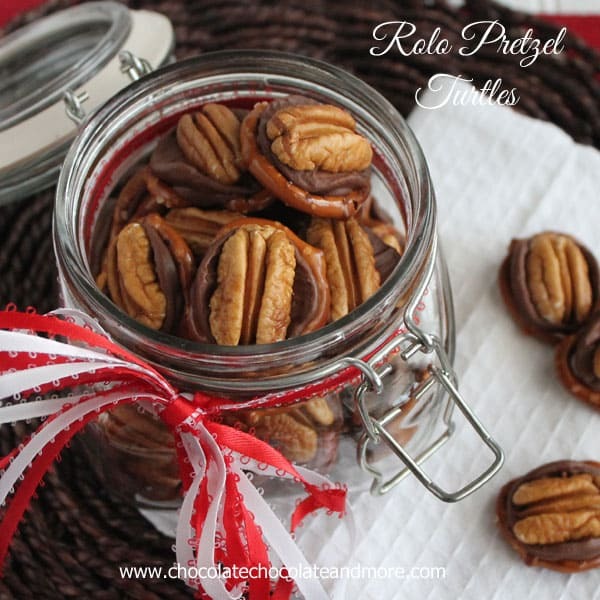 Chocolate, caramel and pecans, the greatest combination ever! No one suffered. I made sure they had the Magic Christmas Bars, Mexican Wedding Cookies, Grandma’s Sugar Cookies, Peanut Butter Cookie Cups, and tons of Bark. Sometimes you just have to keep something out for yourself. Just the really good stuff. You can make these with just one bag of the caramel bits, but, really, why would you want to? Lightly spray or grease a 9 x 13 pan. Combine crushed cookies and butter till combined and cookie crumbs are moist. Spread evenly in bottom of pan, pressing down to form a crust. Now start layering the rest of the ingredients. 1 bag chocolate chips, caramel bits, pecans (save out about 1/4 cup for the top), second bag of chocolate chips, remaining pecans. Drizzle sweetened condensed milk over the entire pan, make sure to cover all the nooks and crannies. Bake for 25-30 minutes, just until milk begins to turn golden. Let cool completely before cutting. Store in airtight container. If you choose to refrigerate these bars, bring them back to room temperature before eating. Looking for more Turtle inspiration? Sounds like a busy holiday for you but a good one. Your bars look delicious, great for a simple but rich sweet treat for the new year. These bars look incredible, Joan! These look great! I have all the items needed and it’s too darn cold to get out today so these will be a nice treat for the hubs! Thanks! Yum … I’ll definitely be making those! So, I’ve now visited this post 3 times. That says something. I’m making these. Yes, right now. Sounds like the holidays are treating you well! 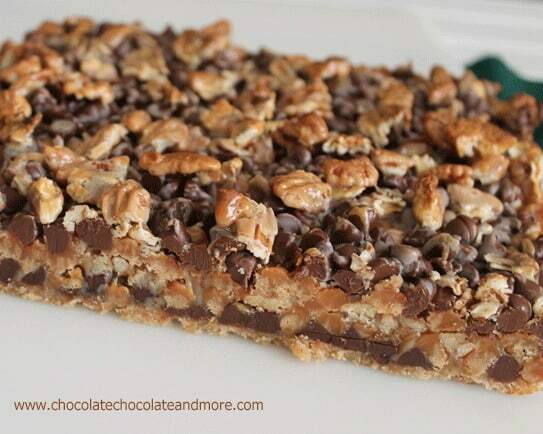 These bars are magical – magically delicious! Need to make these soon!!! Yum!! These definitely are magic! Glad you had a great holiday! Great name for these, they really look sinfully delicious! I love these! =) Your recipe sounds so easy! thanks! I hide treats in the vegetable crisper. I’m the only one who ever goes in there! 🙂 Have a very happy new year, Joan! These have me drooling, so yummy looking! Joan, you always make me drool. These look fab. Happy New Year! Wow, these look sinfully good. Can’t wait to try them. Visiting from a Pinteresting link party and off to pin this. These look DELICIOUS!! I looove turtle sundaes, but not in winter! These will be my new go-to 🙂 Thanks for sharing! This is a to.die.for Killer recipe! I would soooooo love it. Oooo, these look so delish!! 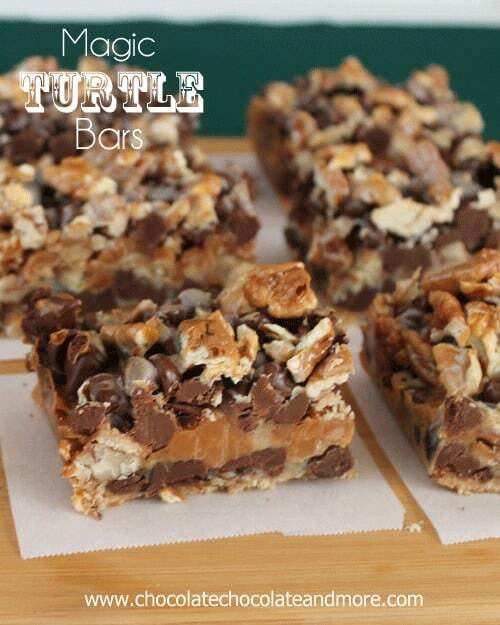 oh my goodness, I love magic bars and I love turtles, these look A-MAZING. I saw your post on crazy for crusts round up, and I can’t wait to try these! Can not wait to try these! One quick question….what size can of milk do I need? Hi Pattie, the sweetened condensed milk is 14 ounces. Mmm I love magic bars – but with caramel to make them like turtles? yum!! 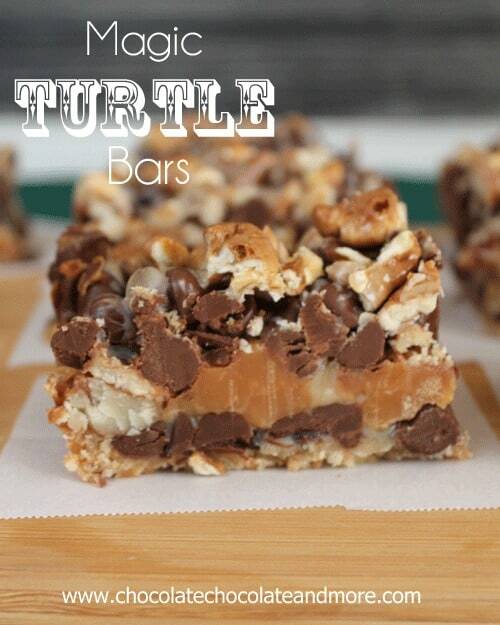 Oh, these Magic Turtle Bars look SO yummy. I found your recipe on Pinterest, and I have a question. I have used sweetened condensed milk before and find that it is really hard to drizzle or pour evenly. Can it be heated in the microwave so that it is thinner and easier to drizzle? I have wondered but have been afraid to try that. What do you think? Thanks and I’m so glad I found you! I’d be careful heating it, I know you can cook sweetened condensed milk and turn it into dulce de leche. I use a bottle opener and poke a hole in the top of the can to drizzle, it does take a few minutes. If the kids are around I let them do it, while I get a head start on clean up. I have these in the oven now. I bought caramels instead of the bits. I chopped them up and hope that it works fine. I was wondering which size bag of chocolate chips you use and are the Kraft Caramel bits located where the chocolate chips are as I have never used these. Also, thanks for the great tip on how to drizzle the condensed milk as it is rather thick. Hi Dixie, I use the 11 ounce bag of chips, it might be 12 ounces, but you can never have too much chocolate can you? You should find the caramel bits near the chocolate chips in your baking isle. Thanks for replying. I shall be trying these. Thanks for replying. I shall be trying these great sounding bars. Can these be made with crushed pretzels instead of vanilla wafers, for a sweet and salty combination? Oh yes Randa, pretzels sound wonderful! The pretzels sound even better. We don;t have the kraft caramel bits in Canada, could I cut up some carmels??? the bars look awesome! Absolutely, The bits are convenient, no unwrapping involved but are still the same product! I just made these but after cooking for the given amount of time and then cooling them I don’t think they cooked through. I’m going to try cooking for another 10 minutes but think I’ve ruined them. Ugh !!! Darlene, I’m so sorry, When you take them out of the oven, the sweetened condensed milk will still be gooey in the center but should firm up once cooled. I wonder if these would work with the boiled sweetened condensed milk caramel. It would be a LOT easier than unwrapping! They sound wonderful! how many ouences of carmel bits do u use? if i can’t find need 2 know how much carmels in weight 2 use. thanks. Each bag of caramel bits weighs 11 ounces so depending on how caramelly you want your bars, adjust accordingly. There is no too much or too little with this recipe, just what tastes good to you in the end! Caramel bits are made by Kraft and you can usually find them near the chocolate chips in the baking section of your grocery store. They are just small unwrapped bits of caramel. If you can’t find them, you can use regular caramels and use kitchen shears to cut them into smaller pieces. Could I substitute a different nut for the pecans? Nuts like pecans and walnuts leave an oily taste/film in my mouth that I can’t stand, so I don’t eat them (and it doesn’t matter if they are toasted or not). Of course you can! Recipes are just a guide for individual tastes, use what you like and enjoy! Can you use peanuts instead of pecans in this recipe? We’re not big on pecans around here. I made these a couple of weeks ago and they were gorgeous. I live in England (where you can’t buy caramel bits), and I had some leftover homemade caramel on hand which had pretty much solidified to a soft fudge, so I chopped that up and it worked wonderfully, thanks for sharing the recipe! Does the recipe call for 1 or 2 cans of sweetened condensed milk? In the recipe, it says 1 cans and I was wondering if it was supposed to say 2 cans. Thanks! Oh my goodness, this look amazing!!! I love anything “turtle.” Putting this on my must-make-soon list!! I’ve been following your blog for awhile but this is the first time I’ve made a recipe – will definitely be back to make a lot more now!! Wow! Thank you so much for sharing this! I made these as a treat for my moms birthday (a turtle lover!) and she couldn’t get enough of them!!! I used caramel squares that I cut into quarters, and it worked perfectly. So rich and decadent, I’ve already been asked to make them again! So glad you and your mom enjoyed them. Just made these and popped them in the oven, can’t wait to eat it! !